The Best Oxford Blogs from thousands of Oxford blogs on the web using search and social metrics. Subscribe to these websites because they are actively working to educate, inspire, and empower their readers with frequent updates and high-quality information. 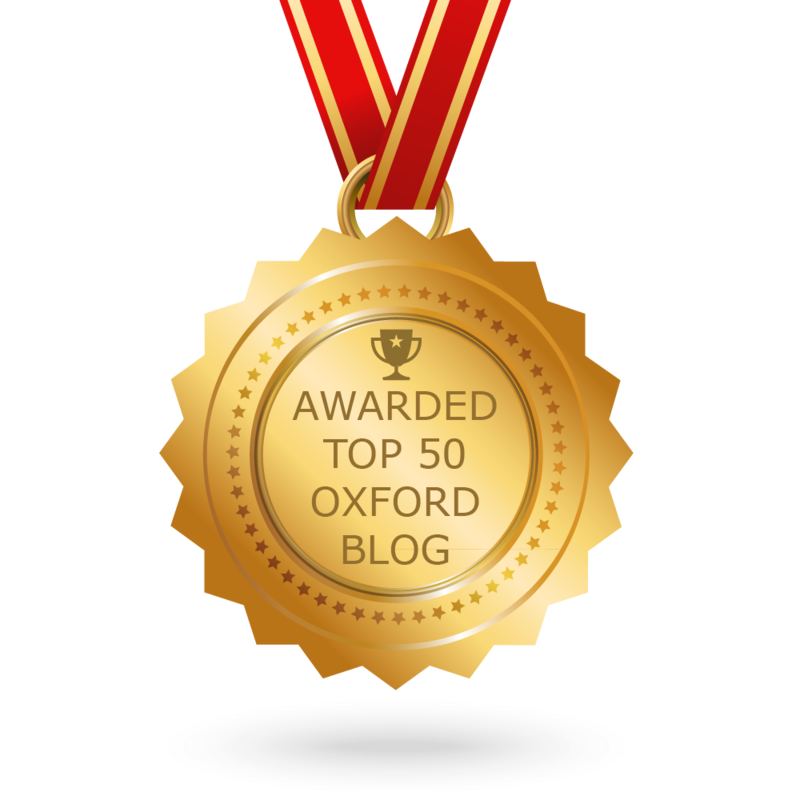 CONGRATULATIONS to every blogger that has made this Top Oxford Blogs list! This is the most comprehensive list of best Oxford blogs on the internet and I’m honoured to have you as part of this! I personally give you a high-five and want to thank you for your contribution to this world. Oxford newsletter is a comprehensive summary of the day’s most important blog posts and news articles from the best Oxford websites on the web, and delivered to your email inbox each morning. To subscribe, simply provide us with your email address. Oxford, UK About Blog The Oxford Times is a weekly newspaper. Follow us to keep up with latest articles on news, sports, business, education and more. Frequency about 168 posts per week. Website oxfordtimes.co.uk/news Facebook fans 1,242. Twitter followers 30,762. Oxford, UK About Blog Oxford Dictionaries focuses on current language and practical usage. It provides thesaurus as well as helpful tips on grammar, usage, spelling, and more. Follow us to keep up with articles, videos, quizzes, word stories, and grammar tips from Oxford Dictionaries for word-lovers everywhere. Frequency about 2 posts per week. Since Aug 2010 Website blog.oxforddictionaries.com Facebook fans 740,570. Twitter followers 292,925. Oxford, England About Blog Oxford City Council is providing latest news on Planning, Waste and Recycling, Housing, local Councillors and Democracy, Leisure, Culture, Transport, and Services in the Oxford Area. Frequency about 4 posts per week. Website oxford.gov.uk/news Facebook fans 13,496. Twitter followers 47,919. Oxford, UK About Blog The University of Oxford is one of the leading universities in the world. Follow us to keep up with articles on news and events from University of Oxford. Frequency about 4 posts per week. Website ox.ac.uk/news-and-events Facebook fans 3,559,755. Twitter followers 468,655. San Francisco, CA About Blog Reddit is a community of millions of users engaging in the creation of content and the sharing of conversation across tens of thousands of topics. Follow us to keep up with a constantly updating feed of breaking news, sports, fun stories and more on Oxford from Reddit. Frequency about 12 posts per week. Website old.reddit.com/r/oxford Facebook fans 1,208,979. Twitter followers 574,636. Oxford About Blog The Oxford Magazine is a luxury lifestyle magazine celebrating Oxford City and its surrounding towns and villages, the people, the places, the events, and the organisations that shape our lives. Frequency about 3 posts per week. Website theoxfordmagazine.com Facebook fans n/a. Twitter followers n/a. Oxford, UK About Blog The Oxford Student is Oxford’s one of the biggest student newspaper, produced by and for members of the University of Oxford. It provides articles on News, Entertainment, Culture, Sports and Reviews to the students of Oxford University. Frequency about 15 posts per week. Website oxfordstudent.com Facebook fans 5,198. Twitter followers 10,308. Oxford About Blog Oxford Mumbler is your online parenting community. Follow us to get information for families about days out, events, classes & playgroups, support & services, pregnancy classes & birth preparation in Oxford. Frequency about 11 posts per week. Website oxford.mumbler.co.uk Facebook fans 263. Twitter followers n/a. London About Blog BBC News is a news website with breaking news on sports, weather, politics and more. Follow us to keep up with news on Oxford from the BBC. Frequency about 4 posts per week. Website bbc.com/news/england/oxford Facebook fans 47,553,367. Twitter followers 9,527,802. Oxford About Blog Welcome to Oxford University Press Blog. This blog is intended for teachers, trainers, lecturers, authors and anyone else with an interest in keeping up with what’s happening in the world of ELT and what we’re up to. We’ll bring you resources you can use in your classrooms, hints and tips for teaching, insights into the lives of publishers and authors. Frequency about 3 posts per month. Since Feb 2010 Also in English Language Blogs, ESL Teacher Blogs, Language Learning Blogs, UK English Teacher Blogs Website oupeltglobalblog.com Facebook fans 255,746. Twitter followers 76,731. Oxford, UK About Blog Good Food Oxford is a network for a better food system in Oxford. It is open to anyone with an interest in food and food production and aims to bring together citizens, local authorities, businesses, academics and other stakeholders to help us all work together towards the shared goal of healthy, fair, sustainable and tasty food. Frequency about 1 post per month. Since Nov 2013 Website goodfoodoxford.org Facebook fans 1,365. Twitter followers 3,105. Oxford About Blog OxPol is sharing research and analysis from Oxford’s Department of Politics and International Relations. The Department of Politics and International Relations at Oxford is a centre for teaching and research. Follow us to keep up with news, insights and research from OxPol. Frequency about 3 posts per month. Website blog.politics.ox.ac.uk Facebook fans 6,297. Twitter followers 4,396. About Blog Elizabeth Rose Blog is created by Actress/Social Influencer Elizabeth Edwards. It’s all about beauty, fashion and lifestyle related in a bunch of blog-like ramblings. Frequency about 2 posts per month. Since Apr 2017 Website elizabethroseblog.com Facebook fans 54. Twitter followers 397. Oxford About Blog Bitten Oxford is your ultimate Oxford food and drinks guide with restaurant listings, news, events, recommendations and more. It helps you decide where to eat, and also where not to. It will be bringing you all the latest news and reviews on Oxford restaurants, pop-ups and street food. Frequency about 2 posts per week. Since Mar 2014 Website bittenoxford.co.uk Facebook fans 3,462. Twitter followers 4,110. Oxford, England About Blog The Oxford Business Law Blog (OBLB) is a forum for the exchange of ideas and the reporting of new developments in all aspects of business law, broadly defined. Frequency about 5 posts per week. Since Mar 2016 Also in Business Law Blogs Website law.ox.ac.uk/business-law-bl.. Facebook fans 1,537. Twitter followers 986. London About Blog The Guardian is the world’s leading liberal voice. Follow us to keep up with articles latest news, sports, business, opinion, analysis and reviews on Oxford from The Guardian. Frequency about 3 posts per month. Since Sep 1999 Website theguardian.com/uk/oxford Facebook fans 8,027,052. Twitter followers 7,311,267. Oxford About Blog The Bodleian History Faculty Library at Oxford houses the University of Oxford’s main collection of undergraduate lending materials in both Medieval and Modern History, as well as in the History of Art and History of Science & Medicine. This blog will update you on new information resources and tools for historians as well as services in the History Faculty Library and relevant parts of the Bodleian Libraries. Frequency about 3 posts per month. Since Nov 2009 Website blogs.bodleian.ox.ac.uk/history Facebook fans 3,460. Twitter followers 6,667. Malta About Blog EC Oxford offers tailored language course shaped to deliver the solutions you’re looking for. The courses offered are suitable for all levels of understanding and are designed to focus on the area of your choice. Follow us to learn to work, to pass exams or just for the sake of it. Frequency about 2 posts per week. Since Mar 2013 Website ecenglish.com/en/social/blog.. Facebook fans 184,282. Twitter followers 6,731. UK About Blog Oxford Royale Academy (ORA) is a British institution with a real passion for international education. ORA’s range of academic, sporting and cultural options is ever strengthening and its international reach is broadening. Follow us to keep up with articles providing award-winning summer courses, exciting Gap Year programmes and insightful Online courses. Frequency about 8 posts per week. Website blogs.oxford-royale.co.uk Facebook fans 46,831. Twitter followers 1,614. About Blog Stock Gumshoe brings reality to the teasers and crazy promises of investment newsletters. Follow us to keep up with secret Teaser Stocks and investment Newsletters from Stock Gumshoe. Frequency about 1 post per month. Since Apr 2007 Website stockgumshoe.com/tag/oxford-.. Facebook fans 4,056. Twitter followers 1,445. Oxford, UK About Blog Oxford College of Marketing is one of the leading Marketing Colleges with Study Centres across the UK and Distance Learning students who come to us from across the world. The college offers a wide range of study and training options for individuals and companies. Follow us to keep up with articles from your Training and Development Partner. Frequency about 2 posts per month. Website blog.oxfordcollegeofmarketin.. Facebook fans 20,636. Twitter followers 2,002. Beaumont Street, Oxford About Blog Oxford Summer Courses was established by a network of Oxford alumni determined to share the magic of the university and the city with the wider world. It offers a range of study courses to students. Follow us to keep up with articles from Oxford Summer Courses. Frequency about 2 posts per month. Website oxfordsummercourses.com Facebook fans 288,471. Twitter followers 666. Oxfordshire About Blog Oxford Health NHS Foundation Trust provides physical and mental health and social care with the aim of improving the health and well-being of all our patients and their families. Frequency about 3 posts per week. Website oxfordhealth.nhs.uk Facebook fans 2,390. Twitter followers 11,853. About Blog Welcome to The Brick Kitchen. I’m Claudia, a baker, photographer. Over here you’ll find some of my favourite recipes, photography alongside travel shots and recommendations from recent trips. Frequency about 1 post per month. Since Jan 2015 Also in Food Blogs Website thebrickkitchen.com Facebook fans 1,256. Twitter followers n/a. Oxford About Blog The Oxford Culture Review is dedicated to promoting arts and humanities events and research based in Oxford. Frequency about 4 posts per month. Since Nov 2012 Website theoxfordculturereview.com Facebook fans 1,609. Twitter followers 1,843. Oxford, England About Blog That Oxford Girl is a student perspective of the application process and life at Oxford University. Follow us to keep up with all the insider tips on what to expect at one of the world’s top universities. ​ Frequency about 3 posts per week. Since Sep 2016 Website thatoxfordgirl.co.uk Facebook fans 369. Twitter followers n/a. Oxford About Blog Bluestocking is an online journal that investigates the intellectual and artistic achievements of women throughout history. It acts as a base for critical and insightful research into the work of female thinkers, raising the profile of women as major actors in the history of ideas, both past and present. Frequency about 1 post per month. Since Mar 2001 Website blue-stocking.org.uk Facebook fans n/a. Twitter followers 246. Oxford, UK About Blog The Oxford Symposium is an international conference for people with a broad interest in food, attended by scholars in different fields, enthusiastic amateurs, writers and chefs held in Oxford. The three-day meeting is a convivial event with ideas and information exchanged over great food. Follow us to keep up with articles from Oxford Symposium on Food & Cookery. Frequency about 1 post per month. Since Apr 2013 Website oxfordsymposium.org.uk Facebook fans n/a. Twitter followers 4,316. Oxford About Blog History of Art at Oxford University draws on a long and deep tradition of teaching and studying the subject. The Department of History of Art combines exposure to a very wide range of art works with the strengths of Oxford tutorial teaching. Follow us to keep up with articles on History of Art & all things visual at Oxford University. Frequency about 1 post per month. Since Mar 2018 Also in Art History Blogs Website oxfordarthist.wordpress.com Facebook fans 6,371. Twitter followers 5,355. Oxford About Blog Welcome to Zaki Charles Photography blog by Zaki Charles. He shares his most recent work and has become known for his signature magazine style wedding images. He brings together the artistic and technical elements of modern photography to create timeless, memorable images of your special day. Frequency about 1 post per month. Since Jan 2018 Website zakicharlesphotography.com/o.. Facebook fans 784. Twitter followers n/a. Woodstock Road, Oxford About Blog Follow us to keep up with the articles from the Oxford University Language Centre. Frequency about 2 posts per month. Since Feb 2014 Website oxforduniversitylanguagecent.. Facebook fans 3,310. Twitter followers 995. Oxford, England About Blog Little Bob Loves is a fashion and lifestyle blog based in Oxford that aims to provide style inspiration with a splash of fashion and lifestyle posts. Frequency about 2 posts per month. Since May 2016 Website littlebobloves.co.uk Facebook fans 82. Twitter followers 2,821. Oxford About Blog The Jericho Kitchen Cookery School is Oxford’s first insitute cookery school with an ethical heart set firmly in the local community. It features cookery classes in oxford, corporate cookery events, cookery schools oxford. Frequency about 1 post per month. Since Mar 2015 Website jerichokitchen.co.uk Facebook fans 958. Twitter followers 1,558. Oxford About Blog Peter Lang Oxford publishes a wide range of academic titles, including monographs and edited collections. Their catalogue is recently established series in fields such as visual culture, cultural studies, education and religious studies. Frequency about 1 post per week. Since Aug 2012 Website peterlangoxford.wordpress.com Facebook fans 427. Twitter followers 1,027. Oxford, United Kingdom About Blog Nuffield College Library’s blog gives advice on using the library and researching the social sciences. Frequency about 1 post per month. Since May 2015 Website nuffieldcollegelibrary.wordp.. Facebook fans n/a. Twitter followers 1,706. Oxford, England About Blog A Rosie Life is an independent Lifestyle Store run by Rosie Jacobs. It is a mix of colour, fun and style underpin the brand, and the A Rosie Life collection, bringing a little slice of happiness into your home. Frequency about 1 post per month. Website arosielife.co.uk Facebook fans 449. Twitter followers 824. Oxford, England About Blog FitFest Oxford is an annual, one-day event, which will be taking place at The Oxford Academy. Follow us to learn, taste, sample and experience everything that the industry has to offer. Frequency about 1 post per month. Since Sep 2017 Website fitfestoxford.com Facebook fans 829. Twitter followers 212. England About Blog Life with Sneha is a UK lifestyle blog covering everything from makeup and skincare to style, fashion, food, travel and a whole lot more. Follow us to keep up with the latest updates. Frequency about 1 post per month. Since Dec 2017 Website lifewithsneha.com Facebook fans n/a. Twitter followers 557. Oxford About Blog Sophie Siddons is a family, couples and wedding photographer in Oxford, Cheshire and beyond. Follow us to keep up with articles, beautiful and natural candid shots from Sophie Siddons Photography. Frequency about 1 post per month. Since Jan 2018 Website sophiesiddonsphotography.co.uk Facebook fans 169. Twitter followers n/a. Oxford, England About Blog Infection, Immunology & Translational Medicine (IITM) is the student’s site for DPhil at the University of Oxford. Frequency about 1 post per month. Since Feb 2017 Website iitmoxford.com Facebook fans 49. Twitter followers 88. About Blog Follow us to keep up with articles on books, travel & technology from Wandering Danny. Frequency about 4 posts per month. Since Dec 2009 Website wanderingdanny.com/oxford Facebook fans n/a. Twitter followers n/a. Oxford About Blog Oxford’s Elite Personal Training service is built on a lifetime of sports, fitness and nutrition experience. It offers gym, fitness instructor and personal training services in North Oxford Elite Gym to its customers. Frequency about 1 post per week. Since Dec 2015 Website immortal-training.com Facebook fans n/a. Twitter followers n/a. The post Top 50 Oxford Blogs, News Websites & Newsletters To Follow in 2018 appeared first on Feedspot Blog.